When you have a heavy-duty product you need a heavy-duty solution. That’s why Rapistak, a leader in high capacity crane systems, turned to Ross for a structural steel racking design that could support their stacker crane and store large injection molding dies used to manufacture car parts for a major U.S. automaker. The challenge was to design and manufacture a dynamic storage and retrieval system that could meet the customer’s demanding production requirements and that would be capable of safely storing 600+ injection molding dies, weighing in at up to 30,000 pounds each. Faced with a tight storage space of 67’ x 200’ x 35’, Ross worked with Rapistak to create an efficient design that provided ample storage space, minimized travel time for die transport and ensured worker safety. 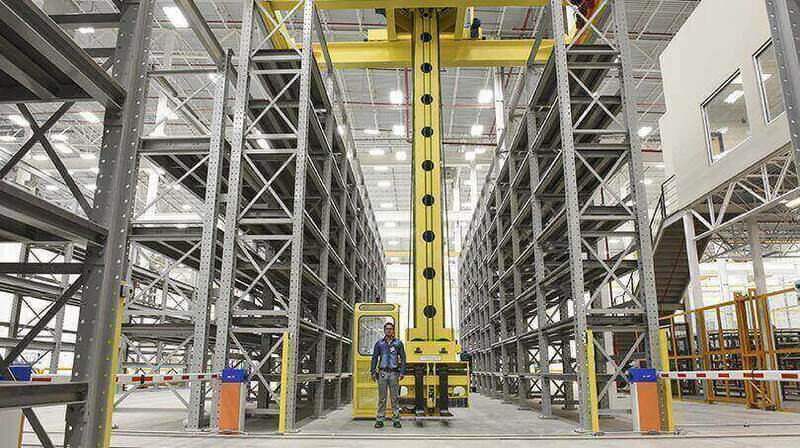 The racking system was divided into two separate sections, each with its own weight capacity requirement ­– 15,000 pounds for small and medium dies and 30,000 pounds for large dies. Both racking systems were engineered with structural steel I-beam construction to support Rapistak’s 7.5-ton “Heavy-Stak” crane, which included a motorized bridge, trolley and rotation with man aboard cab. Ross used steel plate shelving to allow the injection molding dies to easily slide on and off. The die rack system comprised a total of 474 storage locations for the small and medium dies and 128 locations for the large dies. Eight different bay openings ranging from 56” wide to 216” were utilized along with adjustable shelving to accommodate numerous die set sizes.